We’ve known for a long time that influenza during pregnancy can endanger both the the mother and unborn child. During the 2009 H1N1 pandemic pregnant women were six times more likely to be hospitalized than non-pregnant women (see Pregnancy & Flu: A Bad Combination). Worse, in 2011's BMJ: Perinatal Outcomes After Maternal 2009 H1N1 Infection we saw a study showing women who were admitted to the hospital with maternal H1N1 infection experienced a 3 to 4 times higher rate of preterm birth, 4 to 5 times greater risk of stillbirth, and a 4 to 6 times higher rate of neonatal death. Despite these sobering outcomes, many women forgo flu vaccines out of concern over their safety during pregnancy. The science, however, overwhelmingly supports the safety of flu shots for pregnant women. 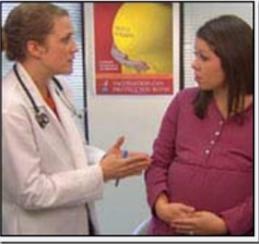 In October of 2011, in IDSA: Flu Vaccines In Pregnancy, we saw several studies presented at the 49th Annual Meeting of the Infectious Diseases Society of America (IDSA) reaffirming the benefits and safety of maternal vaccination.The CDC summarized those studies in Pregnancy and Influenza Vaccine Safety. In 2012, in BMJ: H1N1 Vaccination & Fetal Death Rates, we looked at a large cohort study of pregnant women in Denmark that reassuringly finds no increase in miscarriage among those who received the 2009 H1N1 vaccine. Results that mirrored another study we saw in Hong Kong: No Increase In Fetal Death Among Vaccine Recipients. We've another study, published last night in the journal Clinical Infectious Diseases, that strongly suggests influenza vaccination during pregnancy can substantially reduce the rate of stillbirth. First a link and some excerpts from the study, followed by some excerpts from the IDSA press release. Background. Although antenatal influenza vaccination is an important public health intervention for preventing serious infection in pregnant women and newborns, reported vaccine coverage is often less than 50%. Concern for the safety to the fetus is a commonly cited reason for vaccine hesitancy and refusal. The incidence of stillbirth following pandemic vaccination has been previously studied; however, no population-based study has evaluated the incidence of stillbirth following seasonal trivalent influenza vaccination. Conclusions. Mothers who received seasonal TIV during pregnancy were significantly less likely to experience stillbirth compared with unvaccinated mothers. These results support the safety of seasonal influenza immunization during pregnancy and suggest a protective effect.